Mantaray Film’s recently released documentary Ingrid Bergman: In Her Own Words reveals the legendary actress through her own movies, letters and diaries, including footage that Bergman shot herself. The film premiered at this year’s Cannes Film Festival, and is now being screened at select locations in the United States. Still from Ingrid Bergman’s first screen test. David O. Selznick collection. The referenced screen test is held in the Ransom Center’s David O. Selznick collection. Selznick was responsible for bringing the Swedish actress to Hollywood. In addition to two screen tests of her, the collection of film producer Selznick includes his memos discussing the importance of close-ups of Bergman in the movie Intermezzo as well as the financial returns that a good close-up can bring. Memo from David O. Selznick about how close-ups of Ingrid Bergman translate into better financial returns at the box office. David O. Selznick collection. For the filmmakers of the documentary, the archive provided documentation of the beginning of Bergman’s Hollywood career. 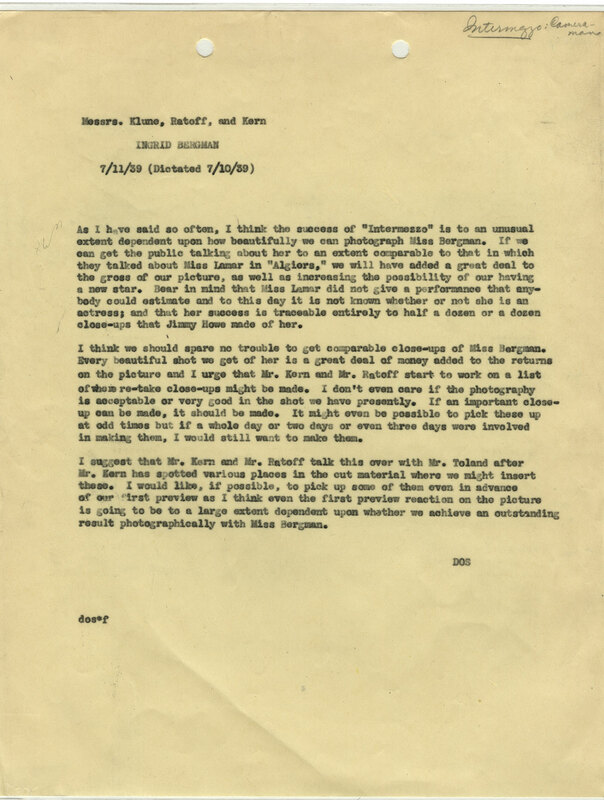 The Selznick holdings at the Ransom Center also include correspondence with Bergman and promotional materials that tout the contract star.